How do I change the limits on my ternary diagram in Grapher? Click the Home | New Graph | Ternary | Ternary Scatter Plot command. Select your data file and click Open. The ternary plot is created. Click on any of the axes in the Object Manager to select it. In the Limits section, click the Select button next to Limits. The cursor changes to: . Press the left mouse button on one part of the graph, where the limits should begin/end. Hold down the cursor and drag the mouse to the other side of the graph, where the limits should begin/end. 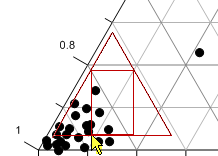 Notice the rectangle and triangle drawn on the screen as you drag the bounding box (highlighted in the image in red). The triangle should always remain inside the limits of the existing ternary diagram. The triangle is approximately the size of the new limits. Highlight the desired axis limits by dragging a box around that part of the graph. Release the cursor and the axis limits for all three axes update. In the Limits section, click the Enter limits button next to the Advanced command. In the Axes Limits dialog, enter the Min and Max value for each axis. Set the ternary axis limits in the Axes Limits dialog. How can I change the size of my ternary diagram in Grapher? How can I view reference points when editing my contour map?